Marko Grujic insists: Liverpool should bring in 'fantastic' £20m attacker for next season. Agree? After sustaining yet another hamstring injury, on-loan Liverpool attacker Lazar Markovic is out for the rest of the season, which almost certainly means he'll be back at Anfield this summer. Is there still a place for him at Anfield, though? 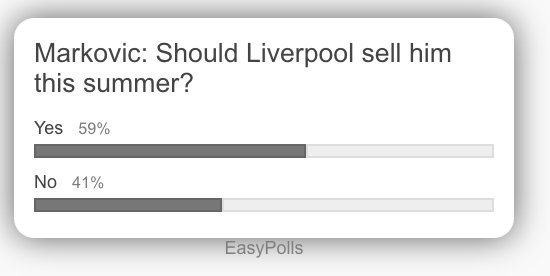 A recent site poll suggests fans want Klopp to sell Markovic this summer, but at least one Liverpool player is keen for the Serbian attacker to remain at the club. "Now I'm so frustrated. I want to contribute to the team play, after all my injuries I've lost all motivation". Markovic has failed to score a single league goal for Fenerbahce this season, and if he can't do the business in the Turkish league, then it doesn't bode well for his chances in the Premier League. "I’d like Lazar to return. He needed time to adapt to England and a new style of play. [Playing] together would be easier for both of us". Can Klopp get anything out of Markovic? The Serb has pace, so that is an obvious plus-point, but in my view, he will not prosper in a structure where the clear priority is intensive defensive/pressing duty. Plus, with his penchant for hamstring injuries, Markovic is arguably better off playing in a less physically demanding league. That said, maybe the presence of fellow Serb Grujic will help Markovic feel settled, and if they can motivate each other to perform well on the pitch, that can only (in theory) be a good thing for Liverpool. Right now, it's doubtful that Liverpool will recover anything close to £20m for Markovic, so perhaps the best option is to put him in the shop window, hope he performs, and then sell during the January transfer window?